The countries that make up two thirds of the world' s agricultural output are experiencing drought conditions. Whether you watch a video of the drought in China, Australia, Africa, South America, or the US, the scene will be the same: misery, ruined crop, and dying cattle. The drought which started in November threatens over half the wheat crop in eight provinces - Hebei, Shanxi, Anhui, Jiangsu, Henan, Shandong, Shaanxi and Gansu. China's largest crop producing province, Henan, has issued the highest-level drought warning. Henan has received an average rainfall of 10.5 millimeters since November 2008, almost 80 percent less than in the same period in the previous years. The Henan drought, which began in November, is the most severe since 1951. Over 100 million cubic meters of water has been channeled in from outside the province to fight Hebei' s drought. As I have previously written, China is facing hyperinflation, and this record drought will make things worse. China produces 18% of the world's grain each year. B) Australia' s lower lakes are evaporating, and they are now a meter (3.2 feet) below sea level. If these lakes evaporate any further, the soil and the mud system below the water is going to be exposed to the air. The mud will then acidify, releasing sulfuric acid and a whole range of heavy metals. After this occurs, those lower lake systems will essentially become a toxic swamp which will never be able to be recovered. The Australian government's only options to prevent this are to allow salt water in, creating a dead sea, or to pray for rain. California is facing its worst drought in recorded history. The drought is predicted to be the most severe in modern times, worse than those in 1977 and 1991. Thousands of acres of row crops already have been fallowed, with more to follow. The snowpack in the Northern Sierra, home to some of the state's most important reservoirs, proved to be just 49 percent of average. Water agencies throughout the state are scrambling to adopt conservation mandates. The Texan drought is reaching historic proportion. Dry conditions near Austin and San Antonio have been exceeded only once before—the drought of 1917-18. 88 percent of Texas is experiencing abnormally dry conditions, and 18 percent of the state is in either extreme or exceptional drought conditions. The drought areas have been expanding almost every month. Conditions in Texas are so bad cattle are keeling over in parched pastures and dying. Lack of rainfall has left pastures barren, and cattle producers have resorted to feeding animals hay. Irreversible damage has been done to winter wheat crops in Texas. Both short and long-term forecasts don't call for much rain at all, which means the Texas drought is set to get worse. The Augusta region has been suffering from a worsening two year drought. Augusta' s rainfall deficit is already approaching 2 inches so far in 2009, with January being the driest since 1989. Enough water a couple of degrees cooler than normal has accumulated in the eastern part of the Pacific to create a La Niña, a weather pattern expected to linger until at least the spring. 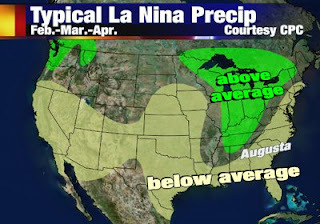 La Niña generally means dry weather for Southern states, which is exactly what the US doesn' t need right now. The worst drought in half a century has turned Argentina's once-fertile soil to dust and pushed the country into a state of emergency. Cow carcasses litter the prairie fields, and sun-scorched soy plants wither under the South American summer sun. Argentina's food production is set to go down a minimum of 50 percent, maybe more. The country's wheat yield for 2009 will be 8.7 million metric tons, down from 16.3 million in 2008. Concern with domestic shortages (domestic wheat consumption being approximately 6.7 million metric ton), Argentina has granted no new export applications since mid January. Brazil has cut its outlook for the crops and will do so again after assessing damage to plants from desiccation in drought-stricken regions. Brazil is the world's second-biggest exporter of soybeans and third-largest for corn. Severe drought affecting Paraguay's economy has pushed the government to declare agricultural emergency. Crops that have direct impact on cattle food are ruined, and the soy plantations have been almost totally lost in some areas. Uruguay declared an "agriculture emergency" last month, due to the worst drought in decades which is threatening crops, livestock and the provision of fresh produce. The a worsening drought is pushing up food and beverage costs causing Uruguay's consumer prices to rise at the fastest annual pace in more than four years in January. The severe drought affecting Chile has caused an agricultural emergency in 50 rural districts, and large sectors of the economy are concerned about possible electricity rationing in March. The countries woes stem from the "La Niña" climate phenomenon which has over half of Chile dangling by a thread: persistently cold water in the Pacific ocean along with high atmospheric pressure are preventing rain-bearing fronts from entering central and southern areas of the country. As a result, the water levels at hydroelectric dams and other reservoirs are at all-time lows. Kenya is the worst hit nation in the region, having been without rainfall for 18 months. Kenya needs to import food to bridge a shortfall and keep 10 million of its people from starvation. Kenya' s drought suffering neighbors will be of little help. Severe drought in northeastern Uganda's Karamoja region has the left the country on the brink of a humanitarian catastrophe. The dry conditions and acute food shortages, which have left Karamoja near starvation, are unlikely to improve before October when the next harvest is due. South Africa faces a potential crop shortage after wheat farmers in the eastern part of the Free State grain belt said they were likely to produce their lowest crop in 30 years this year. South Africans are "extremely angry" that food prices continue to rise. The Middle East and Central Asia are suffering from the worst droughts in recent history, and food grain production has dropped to some of the lowest levels in decades. Total wheat production in the wider drought-affected region is currently estimated to have declined by at least 22 percent in 2009. Owing to the drought's severity and region-wide scope, irrigation supplies from reservoirs, rivers, and groundwater have been critically reduced. Major reservoirs in Turkey, Iran, Iraq, and Syria are all at low levels requiring restrictions on usage. Given the severity of crop losses in the region, a major shortage of planting seed for the 2010 crop is expected. Jordan's persistent drought has grown worse, with almost no rain falling on the kingdom this year. The Jordanian government has stopped pumping water to farms to preserve the water for drinking purposes. Europe, the only big agricultural region relatively unaffected by drought, is set for a big drop in food production. Due to the combination of a late plantings, poorer soil conditions, reduced inputs, and light rainfall, Europe' s agricultural output is likely to fall by 10 to 15 percent. These inventory numbers are dangerously low, especially considering the horrifying possibility that China' s 60 million tons of grain reserves doesn't actually exists. The droughts plaguing the world' s biggest agricultural regions should end the debate about deflation in 2009. The demand for agricultural commodities is relatively immune to developments in the business cycles (at least compared to that of energy or base metals), and, with a 20 to 40 percent decline in world production, already rising food prices are headed significantly higher. Some observers are anticipating “competitive currency devaluations” in addition to deflation for 2009 (nations devalue their currencies to help their export sector). The coming global food shortage makes this highly unlikely. Depreciating their currency in the current environment will produce the unwanted consequence of boosting exports—of food. Even with export restrictions like those in China, currency depreciation would cause the outflow of significant quantities of grain via the black market. Instead of “competitive currency devaluations”, spiking food prices will likely cause competitive currency appreciation. Foreign exchange reserves exist for just this type of emergency. Central banks around the world will lower domestic food prices by either directly selling off their reserves to appreciate their currencies or by using them to purchase grain on the world market. Appreciating a currency is the fastest way to control food inflation. A more valuable currency allows a nation to monopolize more global resources (ie: the overvalued dollar allows the US to consume 25% of the world's oil despite having only 4% of the world's population). If China were to selloff its US reserves, its enormous population would start sucking up the world's food supply like the US has been doing with oil. On the flip side, when a nation appreciates its currency and starts consuming more of the world' s resources, it leaves less for everyone else. So when china appreciates the yuan, food shortages worldwide will increase and prices everywhere else will jump upwards. As there is nothing that breeds social unrest like soaring food prices, nations around the world, from Russia, to the EU, to Saudi Arabia, to India, will sell off their foreign reserves to appreciate their currencies and reduce the cost of food imports. In response to this, China will sell even more of its reserves and so on. That is competitive currency appreciation. When faced with competitive currency appreciation, you do NOT want to be the world' s reserve currency. The dollar is likely to do very poorly as central banks liquidate trillions in US holdings to buy food and appreciate their currencies. This entry was posted in Food_Crisis, Key_Entries. Bookmark the permalink. Fantastic article! There are reports about this all over the web and you've put it all into one very well researched paper! The droughts hitting world-wide, coupled with the tightening credit markets, will lead to lower supplies of food globally, and this will happen a lot faster than most anticipate. Add the legal attacks of Monsanto et. al. against farmers who are not licensing their seeds, and you've got a perfect storm. It's interesting that the market prices for commodities haven't already exploded based on this information. Though we have seen a rise in prices in the last two months, I thought we'd see some serious upward movement by now. I guess investors are still on the sidelines trying to figure out what moves to make next. Eventually, we are going to see food prices go through the roof. Forecasters like Gerald Celente and Peter Schiff have both stated that food shortages, leading to food lines and riots (Celente) are things we can expect in the near future -- at the latest by 2012. Hopefully it won't get this bad! Like many of your posts, quite interesting, but they would be greatly aided if you substantiated your sources. The links to articles are helpful for context, but the data underlying your stories should also be provided/linked. For example, the maps at the top of this post are compelling, but no source is provided. Where did you get the data from to produce the maps? where are you getting your world foodstuff inventory data? could you please provide a link. sources? we dont need no stinkin sources! an article with this much info probably has well over 30 different sources, and i suspect it is quite a pain in the A%$ to have to notate all of those. I'd suggest that you hit some google news searches and I bet you'll find most of the info from the original sources. In any case, great research Eric. "a picture more than 1,000 words." Those pictures are very strong Anonymous! No sources = limited credibility. Sources = much more credibility. Yes, we can search via Google to substantiate Eric's work. But since Eric is already pulling from other sources, it shouldn't be too much of a burden for him to do it himself. If he does it, readers have a reason to keep coming back. If we have to do the sourcing ourselves, why stop by at all? Where did you get the data from to produce the maps? That would be very difficult, and I am not sure it is necessary either. China, Argentinia, Uruguay, California, Texas, Australia, the horn of Africa, and the middle east are experiencing their worst drought conditions in decades. Together, these regions make up about half the world's agricultural output. I doubt any period in the last 50 years has seen severe global droughts on the scale we are seing today. Saw your article on marketoracle, which led me here. Suggest you also research Ug99 wheat rust. Surprised you missed it, since you did include Uganda, where it originated. Ug99 has spread steadily eastwards and has turned up in Iran. This has the additional complication that, by some process I don't understand, the rust is capable of mutating due to the presence of the barberry plant, thereby rendering any currently-being-developed resistant wheat strains obsolete, for want of a better word. So far, I have seen no reports of it having been detected in Pakistan, but the trajectory is Pakistan, India, China, USA. The spores are carried by the winds. Should have emphasised just how disastrous Ug99 could be. Drought AND pestilence. Also, being a global warming sceptic, it is worth considering that if we enter a cooling period (and the sun-spot activity is not encouraging), moisture will become locked up in snow and ice and, presumably, there will be less evaporation from colder waters. As a soil consultant and author in the the field of real sustainable agriculture I find I must disagree with you on a couple of points. 1. What today is called no-till farming, though it reduces fuel usage and erosion, is entirely dependent on expensive and toxic herbicides. No way is it any sort of long-term solution; mostly it's a short-term profit maximizer for the herbicide manufacturers. Serious herbicide pollution of groundwater in agricultural areas has been demonstrated since the 1980s and isn't getting any better. 2. With above 90% of the US and Brazilian soybean crops being GMO, and similar numbers for maize, how can you truthfully say that Monsanto is not a big player or a threat? These GMO crops have been bred for one primary purpose: to be herbicide resistant, so large amounts of patented herbicides can be applied without killing the crop. If the herbicides or the patented seeds became too expensive or unavailable, how could the remaining 10% or so of non-GMO farmers provide enough seed to make up the deficit? (and I'm leaving out the scientific studies showing serious health problems from consuming GMO crops). Perhaps you are ignorant of all of this; more likely you are in denial. Soil mineral chemistry, biology, and real soil science in harmony with Nature hold the long term answers; toxic rescue chemistry and frankenfoods created to maximize profits for multinational corporations are not part of the solution. Continuing to mine the world's agricultural soils for short-term profits will bring what it has brought throughout history. Go out and ask the earthworms on your farm what they think of your farming practices, if you can find any alive. Pure, short-sighted foolishness is what I'm hearing, and I'm not impressed with how cheaply you can borrow money to buy more herbicides, harsh chemical fertilizers, and GMO seeds in a bid to further deplete the fertility of the soil. I live near Austin, Texas, in the heart of the drought-stricken region. Yes, it's been dry. But I can assure you, there are no cattle around here keeling over for lack of water. I can also assure you, if Central Texas produced no food at all, it wouldn't affect global supplies much at all: very little agriculture around here, except cattle raising. And cattle are watered by wells. That's because Texas, historically, has no standing water (there is only one natural lake in the state, and that's on the border with Louisiana). The Texas countryside is peppered with wind-driven pumps to bring water up from the aquifers. Around here, it may be dry, but the picture is not nearly as dire as your article portrays. Congratulations Eric, there's a great deal of research and synthesis here ready to digest. I'd also like cheer the fact that people outside the Climate scope can easily understand that the promises of warm and pleasant weather by James Earl Hansen & Co. are going wrong. A negative correlation between sunspots and wheat prices was first identified in 1801 by William Herschel. It's a lot of information and you must spent a lot of time putting all those together. Thank you. 1) Your inventory data is actually inaccurate. According to bloomberg, world's food inventory at the end of 08 is moderately higher than start of 08.
also, China has 1 year worth of inventory at the moment. 2) much food supply was taken to produce biofuel, if crude continues to be at the current price, those supply will be added to food consumption. 3) most your information isn't what's going to happen, but more on a factual basis, hence, it is completely taken into account by the mkt. reasons that would cause food prices to go up are 1) oil trend up, 2) drought has so bad, that it will impact harvest for later 2009 3) credit situation gets worse and companies on the supply side go bust, however, u'd actually see a drop in price before a rise in this case. I think food will be 70% linked to oil, if oil constant, there isn't much upside on food plays, unless there is more catastrophies(i hope not). if Central Texas produced no food at all, it wouldn't affect global supplies much at all: very little agriculture around here, except cattle raising. Texas produces 5.4% of the US's agricultural output, and California produces 14.8%. Both states together produce more than 20% of US's food output, which means that the record droughts in both areas is affecting a significant portion of US output. Don't forget, other areas of the states are experiencing severe and record drought. Also you are right that NORMALLY, a drop in texas food production wouldn't affect global supplies. However, with record droughts happening in other major agricultural countries like China, Australia, Argentina, etc, the Texas drought now has a much more significant impact. Drought conditions in Texas are so bad cattle are keeling over in parched pastures and dying. 2/4 - Central Texas Hill Country: 24 degrees this morning and no frost – that is DRY! Wheat is toast for the most part. CRC will be a life saver. Some compare this drought to the 50’s or 1984. Some cattlemen have run out of water, and many have culled deep already to make what grass is left last. The bright side is that it did rain after those droughts. If it does rain there will be lots of feed and sorghum planted on failed wheat acres this spring. 2/3 - Lubbock County, Texas: Have I gone back in time? This feels so much like 1983. Every crop that we can plant in my area is in the tank. Milo isn't worth the fuel to deliver it. There isn't a soul in the world that wants our cotton. And for peanuts everyone in America stays 10 feet away from the peanut butter as they shop the stores. If I were a bear I would just hibernate. Might just plant sunflowers. At least they would be pretty to look at. Best of luck to all my fellow farmers out there, 2010 just around the corner. To the young farmers out there, yes it will get better. 1986 came along and the sun came out again. A continued lack of rain across the Gulf Coast region of Texas is taking a toll on the cattle industry. Feed is in short supply, making it difficult for producers in the region to provide proper sustenance. Grasses that usually thrive in the winter months are not growing as abundantly this year due to the drought, according to Austin County AgriLife Extension Agent Philip Shackelford. As such, livestock producers must resort to using hay or other supplements as feed. “If the supplements aren’t high in protein, then you have to supplement further,” he said. But because the drought has lasted for a year, some producers began using their winter reserve of hay during the summer and early autumn months, according to Colorado County AgriLife Extension Agent Dale Rankin. Nice website - i am an Albrecht (via Neil Kinsey) fan. BTW Agricola talks a lot of sense! I am a balanced soil, conventional farmer. Ammonium sulphate, potassium & magnesium sulphates pretty much all i use now (boron +S). Phosphate is unlocked from apatite on my very high free calcium clay soil by point injection of ammonium sulphate solution ( soil pH 7.4-8.4, CEC of 17 after discounting free lime). Yes i know what worms are. You would be amazed how they thrive once you stop destroying soil structure with tillage, and leave residue on the surface to feed then year round. I grow worms that would eat you for breakfast. However i have yet to work out how to talk to them. In Europe (EEC) we don't have then yet. They will never happen on my farm. I could write you a book why and have vigouously 'scientifically' trashed them on UK farming websites in the past, but you would write much the same book. As far as Eric's MS blog is concerned, it is enough to say Monsanto, Syngenta et al are not stocks to own to 'be indirectly exposed to agriculture'. I would advocate using said capital instead to buy an acre of decent soil, with a view to becoming a serious veg garden hobbyist. Re ag chemicals. Some are more problematic than others. In the EEC the worst are long gone. Another tranch is about to go, including most of the triazole fungicides. Rightly or wrongly, this will hit output to some extent. NB You should be impressed with my cheap credit line. How the bloody hell can i afford your wonderous potions without it? Maybe you do discount for 600 acres. But maybe i don't need them. Chemical use is reducing. No PGR, and little fungicide. I do use a lot of systemic herbicide, yes. But expect hand weeding to return to ag within 5 years. BTW Agricole would be fascinated by the work of Prof Sommer, university of Berlin (CULTAN). I would suggest you read it too, but not sure you could read it clearly from the great height you sit. I have not seen such a horse in a while. You see how would up i can get when someone accuses me of being a GMO fan? Another indicator of incentives to produce is stock levels. The ending stock levels of the major trading countries of Australia, Canada, United States, and the European Union combined averaged 47.4 million tons from 2001/02 – 2004/05, dropped to 37.6 million tons in 2006/07 and 27.4 million in 2007/08, as estimated by USDA. Their ending stocks for 2008/09 are forecast up at 45.7 million tons. This number reflects the current higher output for wheat. I didn't include the forecast 45.7 million tons because I believe the USDA's numbers are too optimistic about 2008/09 winter wheat yield given the worldwide droughts. 2) much of the food supply was taken to produce biofuel, if crude continues to be at the current price, those supply will be added to food consumption. Wrong. Mush of the US food supply was taken to produce biofuel. Out of the overall world food production, only a small amount was used to produce biofuel. China, who produces 18% of the world grain, didn't use any for biofuel. So today's worldwide droughts are going to have a much bigger impact than the falling use of food as biofuel. Not really, USDA production estimates, on which current market are based, are way too optimistic. There is going to be a steady stream of downward revisions of those estimates in coming weeks due to droughts and lower production. Glad you replied. I was hoping that would draw you out, and for the most part I like your answers. Yes, ostensibly the EU has been a hard sell for the GMO crops. What I've been reading lately is that your all-wise government there in Merry England is now planning on GMO trials at secret locations on military bases. You will not escape the cross pollination from GMO crops any more than the farmers in the US have. You didn't address my main objection, which was that above 90% of the US and Brazilian soybean crop is GMO and pretty close to that for maize; that makes Monsanto and Syngenta quite significant, IMO. Nor did you address the groundwater contamination from herbicides. From what I've been able to gather, it's not so much the herbicides, though the atrazine is bad, what's hardest on soil life is the modified tallow that's used as a carrier, but perhaps that's a bit off topic for an economics thread. I have little use for any sort of synthetic systemic "icides" myself. You misread me if you think I am any sort of organic purist. Most of my consulting clients are certified organic growers, and many of the home gardeners I work with need to be reassured that the amendments we sell and recommend for their gardens are approved. Simply the niche one is forced to work in if one chooses to be in alternative ag in the USA. I can assure you I hold no one's cow sacred. And as far as I know I'm not selling any wondrous potions. If you are referring to the trace mineral mix or the complete fertilizer I sell in small quantities to gardeners, all ingredients are listed and explained. As to Nitrogen, I don't use it much. The recommendations I write almost never call for any at all, except as a mid-season side dressing for crops that respond well to that. I have three to work up later tonight and none will have N in the Rx, nor do I list any nitrate fertilizers for sale. My emphasis is strongly on phosphate and sulfates; high N interferes with both. I do think there is a case to be made for Chilean nitrate in small quantities, especially in cold soils; it's also a great source of Boron and Iodine. And not approved for USDA Organic use. Nitrogen and Potassium fertilization are what has made our food supply so poor worldwide. I consider real agriculture a fine art, and those two might be the equivalent of printed reproductions for the uneducated, with a lot of unfortunate health consequences. As far as discounts for 600 acres, I have good connections in much of the world for soil amendments. I usually put those who need large amounts in direct contact with the mine, with a small brokerage fee understood. If you know anyone interested in orders of 40,000 tons and up of premium New Mexico humates, we can probably set it up this week. With regard to Texas' food output, most of it comes from the Rio Grande Valley and the Coastal Plain, where there was an abundance of rain in 2008, and the Panhandle, which is irrigated. The drought area is centered over my house in Central Texas. Not much grows around here except mountain cedar and scorpions. I drive thru the countryside a couple of times a month. The cattle are OK. The ranchers are not, of course; they need to pay more for feed since the pastures are dry. I wonder how much of the angst in the media is aimed at generating a gov't handout since the economics are so poor? You are correct that they will thin inventory, reducing meat supplies --- but won't that free up more grain for humans? You forgot to mention, or did I miss it, that in many drought areas there is vigorous chemtrail spraying. Much of it off the airline routes and criss-crossing the skies. The chemtrails have been observed to fall on to rainbearing cumulus which then rapidly dissipate into unnatural looking wispy segmnts. The chemtrailing especially in Oz has been observed to be vigorously carried out whenever rainbearing cumulus approached the SE coast- line. Heavy chemtrailing has recently been reported in Mexico, Croatia and also worldwide. Dunno about China or Russia. So now you see how easy it is to raise food prices. And consider that the banksters eventually take over the land that the farmers can no longer pay for. Should the chemtrails theory be taken seriously? It might help if one of its proponents could spell out in sufficient detail how an international chemtrails conspiracy could be motivated, originated, managed, funded, and kept entirely secret for years. It might help if its proponents laid out some clear evidence of how the process (supposedly?) works, rather than just repeat assertions along with pictures of skies which prove absolutely nothing conspiracy-wise. While the situation in most of the world's traditional grain baskets is disturbing, I should point out that this is not the case everywhere - in particular, Russia, Europe and Canada are not affected by drought. As we know Canada, France and Russia are major grain exporters. I don't know about the former two, but in the past year grain production in Russia increased from 86mn tons to 113mn tons which means it will vastly increase the amount of grain it exports. A similarly big harvest is projected for 2009. Finally, I should point out that (and I do agree that global food security is a major medium and long term problem) even in the world case scenario the world is still several years from regionalized famines. Apart from world food reserves there's also the reserves locked up in livestock, in both meat and in the grain that they consume themselves. Robin Clarke, it's really up to you to do the homework. There is plenty of info on chemtrails out there besides photos and theories. What might be a better question is just what ARE all of those planes doing up there criss-crossing the skies and laying down even blankets of something or other? Someone is up to something, as jet fuel and air crews don't come free, yet we don't deserve an explanation even if it's a lie? I live in the southern Caribbean off the coast of Venezuela and I've seen the sky blanketed with chemtrails here occasionally; evenly spaced bands crossing at 90* angles. Venezuela doesn't even have an air force nor does any other country near here. Just what IS going on? Why didn't we make the map???? How can you leave off a whole country? Don't expect that Clarke would ever research anything on his own. After all we've always seen complete whiteouts from plane trails, huh? The reason he's probably looking for evidence is because he's flying one of the planes and knows ordinary folk could never get full disclosure on their black ops. So....crew member or just another sheeple. Take your pick. The assertion that Australia is in drought is false. Australia received more than enough rain - given that much of Queensland is in flood. What Australia lacks, as a result of decades of government inaction is the infrastructure to catch, store and distribute the water to where it is needed. True, Russia, Europe and Canada are not affected by drought. However, they are being affected by low grain prices and lack of credit. The most optimistic forecasts call for a decline of 2 to 3 percent in food production in those areas, and pessimistic forecasts call for a decline of 10 to 15 percent. So even in areas unaffected by drought, smaller harvests are expected in 2009. Food production is going to fall even in those areas unaffected by drought. As we know Canada, France and Russia are major grain exporters. I don't know about the former two, but in the past year grain production in Russia increased from 86mn tons to 113mn tons which means it will vastly increase the amount of grain it exports. The reason 2008 had such a good harvest is because grain prices were soaring during the first half of the year. Farmers planted the best seed on the most land possible and used the best fertilizer. 2009 is the exact opposite. Farmers are planting less using the cheapest seeds and little if any fertilizer. A similarly big harvest is projected for 2009. Which is a problem. These forecasts are COMPLETELY delusional. You will see estimates revised down again and again in 2009. Finally, I should point out that (and I do agree that global food security is a major medium and long term problem) even in the world case scenario the world is still several years from regionalized famines. Not necessarily. If droughts continue around the world and China's summer crops are affected, food insecurity will be a 2009 problem. Apart from world food reserves there's also the reserves locked up in livestock, in both meat and in the grain that they consume themselves. Yes, but "unlocking" these livestock reserves will send meat prices into the stratosphere. Do you think Americans are ready to stop eating hamburgers and hotdogs? Sorry, about that. I will include it next time I update the map. The assertion that Australia is in drought is false. Australia received more than enough rain - given that much of Queensland is in flood. Australia IS suffering from a drought. While Queensland was flooded, drought-hit Southeast Australia went up in flames, killing over 200 people. At least one thing still seems to be true: when it rains it pours! Farmers around the world should be reducing production so that it more closely matches consumption. If they do not, they will loss their grandfathers land and massive starvation will then occur with the land in the new consumer unfriendly hands. Farmers can only feed the world if they are profitable. Food price rises caused by shifting land control to corporations hurts everyone, even their own employees. When it is too late, it is too late. I JUST WONDER IF TIS GLOBAL DROUGHT IS A DESIGNED EFFECT DUE TO THE MASS CHEMICAL SPRAYING OF OUR ATMOSPHERE. I LIVE IN BYRON BAY.AUS. THERE IS OFTEN HEAVY SPRAYING IN THE WESTERN SKYS WHEN THE HIGHER ALTITUDE WINDS ARE BLOWING IT OUT TO SEA.MMM ANY THOUGHTS ON THIS ? Well done, it's great to see a responsible citizen using their initiative, getting real and living in facts not fantasy land. keep up the great work. You can run this link aside of your article if you like and maybe wake up a few more "ostriches" to how serious this global conglomerate problem really is! "if your worried about get an omega garden"
Sorry, wrong. Omega is a hydroponic system, very high tech, special nutrients etc. Nothing like that is going to feed your family. Forget it. It's fine if all you want is to grow salads and pot. Here is reality: Those of us who eat reasonably well are used to getting around 2,000 kcalories a day. You could not eat enough hydroponic vegetables to equal 1000 calories, forget 2000. Think you could eat 20 to 30 pounds of fresh vegies a day? Would you want to? And you can't live on vegetables anyway, especially not in a temperate climate. With excellent soil and intensive gardening, one could perhaps feed a family of four on 1/2 acre, which is about 20,000 sq ft or 2,000 sq meters. Over half of that would need to be devoted to grains and legumes (beans, peas, lentils). That does not include area to grow grain to feed chickens or pigs. If you want beef or milk, you will need another couple of acres of pasture, minimum. Forget these silly things like hydroponics and aeroponics, and forget about trying to feed anyone a complete diet from anything like that; it is NOT going to happen. Food grows in the soil, the Earth, with sunshine as its energy source. There is plenty of free info at that site, enough to allow you to survive a food crisis if you learn it and start to apply it starting about NOW. I have not studied the drought issue, it is an interesting topic - you may or may not be correct regarding it and possible food shortages. I have no way of knowing from reading your article. However, what you consider "sources" appear to be primarily second?, third? hand news articles, or worse - other blogs, all of which are notoriously inaccurate in general. From a scientific standpoint your sources may essentially be like the old game of telegraph - where a story is repeated through a line people and by the end is totally unintelligible from the cumulative error effects. If you have time to write the article, you should have time list your the original sources of the data supporting your suppositions. Frankly, there is way too much unsupported "information" floating around in a world where the vast majority of the people are are clueless regarding critical thinking. NO future in beef production. SACRAMENTO, Calif. – Gov. Arnold Schwarzenegger declared a state of emergency Friday because of three years of below-average rain and snowfall in California, a step that urges urban water agencies to reduce water use by 20 percent. "This drought is having a devastating impact on our people, our communities, our economy and our environment, making today's action absolutely necessary," the Republican governor said in his statement. Mandatory rationing is an option if the declaration and other measures are insufficient. The drought has forced farmers to fallow their fields, put thousands of agricultural workers out of work and led to conservation measures in cities throughout the state, which is the nation's top agricultural producer. One can print up all the money they want and give it to whoever they choose, it isn't going to make it rain or grow food where there isn't any water. I work in the ag industry in the US. I can tell you from within the industry that much of what you read here is nothing more than fearmongering. Will there be challenges? Sure...there always have been and there always will be but that is the nature of farming. filtering sewerage to reuse it like VT. It doesn't look anywhere near as severe as your map. I certainly know that global agriculture is in terrible straits; but to produce a detailed article without citing sources -- or citing sources that wouldn't even be accepted in a first-year college course -- is very damaging to credibility. Reading this thread has convinced me to short fruits and nuts. It looks like their support levels are going to collapse. Perhaps the reason sources cannot be cited is because much of what is presented as fact has no basis in truth. It is obvious that someone has an agenda here. US drought monitor and you will see that it drastically understates actual drought levels. 2) In my drought map, I was focusing on how much of a countries aggricultural land was affected by drought. So although Alaska isn't experiencing a drought, the state has little aggricultural output so I discounted it when creating the graphic above. Also, since Texas and California together produce 20 percent of US food output, record breaking droughts in those two states alone greatly impairs US food production. Did you notice the comment above where I posted the link to fifteen of my sources? That is on top of all the links in the article itself. Again, did you notice the comment above where I posted the link to fifteen of my sources? That is on top of all the links in the article itself. Hey Eric, you don't suppose you are getting hit by a little spam, do you? Excellent work, by the way. Thank you, and I have cited it a couple of places. Gee, whillikers, I sure was scared. Never let the truth get in the way of a good story. Does this mean i cant order mcdonalds with a slurpy anymore? This is catastrophic!!!!!!! Drought and flood are often seperated by only a few miles, as locally heavy rain spills over and floods river bottoms, in drought stricken valleys. Also note that these maps while pointing out an important fact, are in fact useless in actually reporting drought/flood/crop growing situations in any significant fashion. Food production is not determined by averages, but by the specific conditions in a local place and time. Rain delayed by two weeks can change crop output a significant ammount, and a small rain at the right time can make a major difference. Almost perfect conditions all summer can be erased by a storm which destroys a total crop in a day, and a snap shot picture of drought conditions on a day in the spring is not a predictor of local conditions later in the summer. The old farmers saying "plant in the dust, bins will bust" referes to getting a crop in early and having the full benifit of late spring rains (they almost always come) and cooler early growing season. Global warming could give us a worldwide disaster this year, or some year, and to this extent this is a good warning, however, let's be real -- I'm looking forward to getting into the field soon, and expecting a great crop! Eric said on February 10: "USDA production estimates, on which current market are based, are way too optimistic. There is going to be a steady stream of downward revisions of those estimates in coming weeks due to droughts and lower production." Comment: since your post, wheat prices have not increased, they have actually dropped. December 2009 wheat went from 6.28 on Feb 10 to 5.84 on April 17 (WSJ). "The 2008/09 season-average farm price is projected up 10 cents on the lower end of the range to $6.80 to $6.90 per bushel. This is well above the previous record of $6.48 per bushel in 2007/08. The weather is unpredictable and who really knows what it is going to be for the current growing season. Be careful about making weather forecasts! Sorry but in case of Chile that`s not true. winter has not started yet and water levels in reservoirs this year are ok. The only emergencies declared are because of volcanic activity, Llaima and Chaiten. So far the Government has not declared any national emergency regarding possible droughts in the near future. Perhaps you are referring to events at the beginning of last year. 2009 looks OK climatewise. Thought you should know about this Eric for your food research. "Australian wheat exports fall 19% in April"
Both export and domestic sales fell. Wonder how this will affect the big picture. Oh and adding to my comment just above having scanned other aussies comments since,I myself would say we have been in drought here on the se corner of nsw at least,but we had good falls last week that should be excellent for winter plantings in our region at least. However the article does state that these sales results come after a bumper harvest.Haven't investigated that myself, just the large number, 19%, caught my eye today as odd. I live near the south tip of Lake Michigan. My strawberries are 2 weeks late this year. This is wild! Especially when coupled with the reports of a wheat fungus that may take out 80% of the world wide wheat crop. Fols this is famine of a bilical proportion. Get ready! Let's see - this article was written back in February of this yr (2009). How has the price of wheat done this year? Well it peaked back in March or so but has come pretty steadily downwards since. The world is in sorry shape, but at the present point-in-time, a catastrophic fall in food production seems not to have occurred. It's always good to check up on these prognostications after the fact. The price of wheat was way up in March of last year, 2008. It seems to be trading currently at about the same range as in back in Feb. of 2009 when this article was first written.